5 Years ago I sat down at my kitchen desk, turned on my computer's (horrible quality front-facing) camera, and recorded (on impulse) my simple budgeting method; how I track my weekly budget using an envelope. Little did I know that this simple method and terrible video would be one of my most viral principles ever! It's long overdue, but I finally sat down and made an updated version of the video, with new tips and – you're welcome Video Land – a much better quality camera. Then, after you watch the video, come back for a few additional tips and clarifications. Oh! And of course, FREE PRINTABLES! If you don't want to hand-write each of your envelopes, then click HERE to download our free printables. Good luck with your new budgeting system! What about a household of 1 or 2? Do the single person and the couple still get $300/month for groceries? I assume yes bc you still have to buy all those household items. Planning out my meals (and then sticking to it, not making whatever’s quick bc I’m HUNGRY) is the hardest change for me. But I eat better when I stick to this. Healthier body and healthier budget? Double win! Yes $300 for a household of 1-3 is where you should be at! 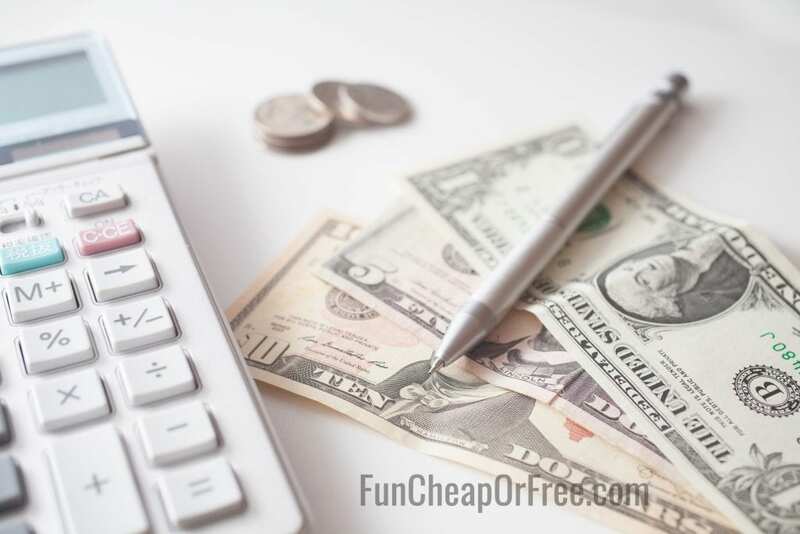 I have a very similar system with a few slight changes – I budget $250 per week for grocery and other – So I combine the 2 into one weekly envelope. If there is $ left over at the end of any week, it remains in the envelope until the end of a four week cycle. At that point I transfer it into our savings account. It gives me the flexibility to have that extra cash on hand for a meat or bakery or Costco order, for example. While I understand your point about not going over the weekly limit, I would prefer to keep the extra cash available for a planned larger grocery haul, rather than a shopping trip just for the sake of spending the extra money. Also, my husband has a credit card that we use to make most purchases to collect much needed airline points to visit our son overseas. Each month he buys gift cards to the food shops that I frequent using his credit card. I then reimburse him with cash and use the cards for grocery purchases… Win, win! Points and I am still technically paying cash! Thank you for the video … Your enthusiasm is remarkable! Any tips for using this with Amazon? Some of my purchases on Amazon are consumables and some are other. Also I can look at my orders but won’t have a receipt. Also what if my husband and I split our Other purchases? Do we just split our Other total? What if he’s not on board with this? Do I just do my best with my envelope? Thanks! Your envelope should cover what YOUR spending responsibilities are, your husband’s spending shouldn’t affect your envelope in any way. So divide that up FIRST! As for online expenses, they count! They need to come out of your budget, so write them on the envelope just like everything else! What do you do with online purchases? Same! Write them on the envelope just like anything else! Jordan, you are adorable! I have LOVED this tip for years and wanted to share it on our blog: http://www.dealstomealsblog.com/2017/07/05/jordan-pages-simplest-budgeting-method-ever/. Hope that’s okay? I linked back to you 😉 Keep up the amazing work! Two part question, have you every thought of a payment plan type of option for your financial bootcamp? I would love to do it but need to budget for it. Also do you mirror this for household expenses? I’ll take the payment plan into consideration! It usually works out because people will just set aside $25/week or so, and will have enough for the program in a few weeks. So maybe you could try that? Use the code FCFBLOG for 10% off which also helps! Hey Jordan! I am starting your envelope budget today. Thank you so much for sharing your system with us! 1) what do you do with excess? Do you keep it for the next month? Or do you deposit leftovers into savings? How do you handle Christmas and birthday presents? So if you do a Costco run or Walmart run…maybe even Target and are purchasing things that belong in “grocery” AND “other,” do you just have to go through your receipts to figure out how much to deduct from each category? Does that make sense? Next question that has NOTHING to do with any of this. Ha! Can you give me some tips for having your kids 18-months (or so) apart? My first two are 22 months and my oldest handled it like a champ. But my 18 month baby boy is sooooo clingy to me. I’m due soon with our third and wondered if you had any tips for handling a new baby when I still feel like I HAVE a baby. Ha! Hi Julianne. I was having this issue too. What I ended up doing is just separating it into 2 transactions. So I have 2 nice receipts. The cashiers never seem to mind it. Hello There! Question J, how much do you budget weekly for your other budget? Also, how to you budget for new clothing or to get your nails done or even a pedicure? I would love to see a video or a picture of an envelope from your June budget just to see how you adjust if you go over budget! Thanks J! I, also, am confused how you figure out how much to budget for the “other” category. Is it different every week or the same? So confused ! It should be the same every week. So set an amount, and work with that! If there are only 2 people in your family (just me and my spouse) should we only budget $200 each month for groceries? In the video you mention $100 per person per month starting at $300. So do you suggest budgeting $300 for groceries per month? If you could get by with $200/month that’s great! But $300 is probably more realistic. Don’t go over $300 though! What would budget look like for 2 people (me and my husband) And I also babysit 1 three year old full time and watch my 2 grandchildren (3 and 6) full time and feed them also so I need to include breakfast, lunch, snack and sometimes dinner for them. Would I be budgeting for 4 people? Right now I seem to be spending at least $800/mos if not more because I have no time for couponing like I used to so I do most of my shopping at Costco and I buy a lot of fruits/veggies for the kids. Hawaii is very expensive so I agree, you would need more than $100 – maybe more like $150/pp. Just test it a bit and see what you can do! Aloha Ray, I am also in Hawaii-in Kaneohe. I have a family of 5 and find that $150 per week suits us fine. I do not coupon. I shop at costco and times mostly. I find that I can only stick to my budget IF i meal plan and do not go crazy at Costco (lol). I buy lots of fruits and veggies and since meal planning, ive been having to buy less at Costco and also experiencing less food wastage. Aloha Hoku, I was just going through my emails and came upon you reply to my question about budget. I was just telling my husband that we really need to sit down together and start meal planning so we can cut back on our monthly grocery budget. I’m definitely going to try it now seeing that it helps you keep to your $150/wk budget. I too buy a lot of fruits and veggies since that seems to be the only things the kids really eat. What did you do for your family budget when you earned $31k/year? We can’t afford to pay a mortgage or rent in the new area where my husband got a job (not unless we want to pay over 50% of our income on housing and utilities – and have no money for anything else). This sounds like a really simple method to try, but I’m confused about your husband having separate envelopes. If I’m trying to figure out our entire monthly budget, I would need to know what my husbands envelopes are for and how much his should be as well. You said his is for going out to eat, but you also said your “other” is for that as well. How do I know if it comes out of mine or his? I would love to get some clarification on this. Are there any other envelopes that your husband has? I’m the one in charge of the finances, so my husband would probably just rather I keep track of everything. Thank you! Hey Holly. I was having the same issue with my husband. From what I understand the envelopes her husband has are what he spends on and she doesn’t spend from her envelopes for eating out or entertainment. But I’m with you and I just keep track of it all myself. When ever my husband spends anything I make him give me the receipt or write it down on a post-it how much he spent (we use card not cash). We have to communicate a lot more with doing that, and I end up telling him how much he can spend on something based on the budget for that week/month. I was wondering where does day care fit in? I was thinking family budget with the monthly bills but I’m not too sure. Thank in advance for your help. Me and my husband started your system three months ago and have loved it! The first two months were working on becoming accountable to the weekly budget (rather than our monthly- oops missed the budget again system). Last month (even being December!) we finally were within our budget!!! Thank you very much for posting about this and for the free envelope printable’s. We divide our monthly budget into 5 columns (Grocery, Family-him (gas) , Family-her (standard bills), other-him, and other-her) that way both me and my husband have our own envelopes on the bills we are in charge of. Thanks again. When i am putting down the totals on the envelopes and you are grocery shopping on a saturday and your week ends on a Sunday that grocery money is for the upcoming week. So today is Monday but i purchased groceries this past satuday which was last week. Should i do my weeks satuday to saturday or just think that I am spending it at the end of the week? You can choose your weeks, as long as your budget isn’t longer or shorter than 7 days! I am giving this a try. So far, I am a bit confused because I keep crossing over my cash/debit spending with other/grocery and forgetting which comes out of which side. Our food money is SNAP right now so I think I need FOOD/GROCERY/OTHER until the food comes out of grocery as well because that confuses me further-?! But it’s only the first week and I plan on sticking to this for the 3 months like you said. I love this idea! Ready to try it with the new month coming up! I’m going to try adapting these concepts! Thanks so much! It is seriously so simple, but since I started doing it we have saved so much money! I was going to the grocery store way to often and this really opened my eyes. Thank you! I tell anyone who mentions a budget to me that they need to watch and try this! Your envelope system is absolutley brilliant. The first system that resonates with me. So sensible! These videos are the reason I started following along. This budgeting hack is so simplified and has been so simple to work into our family life. Thank you!! I loved this video! It helped me realize that our budget it too complicated and that is why it just isn’t working for me! Thank you for your amazing tips! Love this budget method! Envelope fits tight into my wallet and so simple to keep track of. Saved us lots of money so far….so thank you! I’m new to this method but so far it’s helped a ton. I’m still figuring out how much to put in for each week. I have a family of 7 but I don’t have a hundred dollars per person. Sometimes I do and sometimes I don’t. I think I just need to hang in there for a little longer. I’ll get it figured out aventualy. Thanks! I LOVE this method! I am so excited about it that I have shared it with all my family. So simple but makes such sense. Thank you! Love this idea about budgeting by week instead of for the entire month. I will definitely be trying this. Thank you! Thank you for sharing these tips. The hubby and I have been trying to work on being better about budgeting. Trial and error, but not giving up. The hubby and I stumbled on to your page in January and it is has helped us be more serious about budgeting. Thank you for sharing. I do this now and love it!! I have a hard time treating myself to a Starbucks or timmies (canadian) but If it’s close to the end of the week and I see an extra $20 in our food budget, I’ll treat myself to that .80 donut! This is the best! A serious game changer for me! It’s so logical. Thank you! This is so simple but so good!! I’ve been using it for months. I think my favorite part is having the receipts all in one spot (instead of the bottom of my purse or car floor 😂). Love this! Simple and easy! I went to do this and failed miserably…I definitely need to work at it a lot more! Hard thing is that my boyfriend is home for 2 weeks and gone for 2 weeks and I meal prep for him so he has good cooking when he’s gone on the rigs for 2 weeks. We are a family of 3, him, our almost 2 year old and me (hoping to add another soon!) so that’s $300/mo, $75/week however I feel like I need to make it $100+ when he’s home to buy food to prep and $50 or lea when he’s gone. Idk! HEEEEEELLLLLP!!!! Hopefully we win a budget boot camp pack and we can really start saving!! This one helped us out a lot thanks! I LOVE this method! I’ve used it for several months now and tell everyone about it! I am going to start doing this today! Thank you so much for this advice! JUst started this! Thank you so much! This is so helpful! This is the first video I saw of yours. Now i’m hooked and motivated to save money and pay off debt! Love using this – so simple and so effective! I have been using this for several months now and it works wonders! Thanks, Jordan! Finally an envelope system that works!! This system is actually saving us money and is way better than any other envelope system I’ve tried in the past! This budgeting system has helped my family in so many ways!! I will never shop any other way. Your budgets are amazing. Simple and easy to understand and I love that they are something that works and worked for your family. It’s not just something your trying to sell. It’s something that is genuine. Also easy to adjust for everyone else’s situation. Printed them…used them, but it’s so hard to learn a new routine!! I’m gonna keep trying because I think I works for sure! I love this method!!!!! Totally going to try this!!! My hubby and I are working on splitting the budget so I know what I’m CFO over lol!!!! I watched this video last night & LOVE the simplicity of this method. I’m doing it!! Thanks! I have such a hard time with cash, going to try using the “envelope” method, but with no money..just keep track of what I spend with debit card daily and try to stay within budget. Yikes! OK! So, this system completely changed how I think about budgets! I am a budget girl and have adhered to one for a long time but ALWAYS wrestled with creating a “perfect” budget that worked for each month/each situation/and for both hubby and I ( I get lost in ALLLLLL the details…smh) …so for years now, we would rework how we do the budget…like every few months. I know, it’s insane and exhausting. This was the very first blog post I read of yours and I have read it over an over (along with the other budgeting posts) and slowly we have been simplifying what we do to resemble this. I can’t thank you enough! My hubby and I used to be so good at budgeting in the early years of our marriage. Then life happened and now we need to get back on track. Excited to give your system a try! Love this. I know do it every month. This envelope system has already been so big for us. We’ve only been doing it for three weeks so far (started the moment I saw the video) and my husband is already surprised by how much less money we’re spending. We have enough money to live on but still end up transferring from savings at the end of the month and now our savings is nearly gone, so this plan came in the nick of time. We’ve tried Ramsey’s envelope method but we’re always a bit overwhelmed with the cash part. This has been awesome! It’s like a game for us to…an obtainable goal. Thank you so much for sharing all your tips Jordan, they’re so needed! Seems so simple and easy, which is great cause some others methods i have tried make it more complicated. I love this tip. I have followed Dave Ramsey, Suzy Ormond, Tony Robbins all to just say all along “How do I know how much to budget for food? Just someone tell me!” Thank you. I love this! Food budgeting has been my biggest question for years! Thank you. 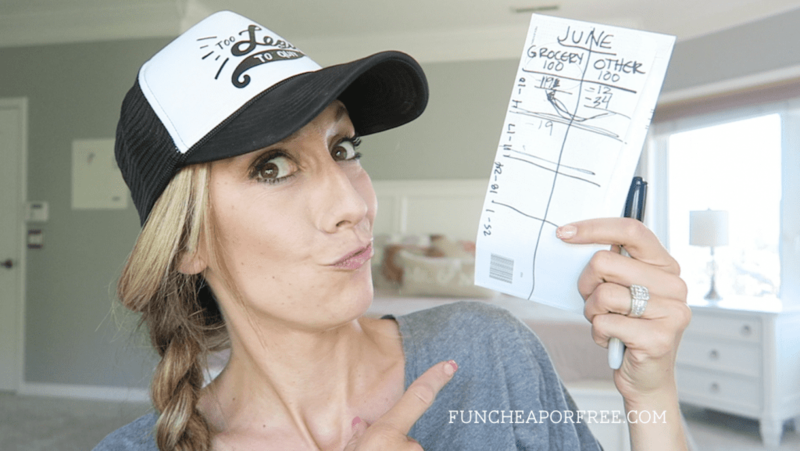 This budgeting method has been a serious game changer!! I used to spend all of my food and other budget money so early in the month and then be left with nothing for the rest. This totally fixed the issue. I just tried it this last month and it was the most no stress budgeting month yet! THANK YOU! Oh my goodness! This is so simple that I can be consistent at it!! Thank you. This came at the perfect time as we are trying to head off our own FD. This changed my life!!! !ive tried so many techniques but this just spoke to me and I have no clue how much it’s actually saved us but a lot for sure.. This tip has been the most life-changing tip you have ever shared, HANDS DOWN!! I have been using it for about 6 months now, and I have such a better handle on where my money is going each month!! And I can purchase “splurge” things with confidence. Now, sometimes I still overspend, but I can go back to my notebook (I use a notebook instead of an envelope) and find out exactly where I got out of line and how I can fix it! Especially the grocery, shopping in bulk saves but it always threw off my budget (like a $300 trip to Sam’s Club!). So thank you SO MUCH for breaking this down for me. Love it! The “other” budget has changed my life!! Thanks Jordan!! I love your blog and have watched many of your videos! My sister and I follow this and I know it’s helped us! Thank you for all your advice!! Going from Once a mouth shopping to this has been a challenge….but has saved us sooooo much money! Thank you! These are all great tips. Can’t wait to get started. Thanks so much!! I know you say $100/person/month…I don’t know how to do that?!?! Probably better planning than I do….I really want to win one of your budget bootcamps!! My husband loves Dave Ramsey, but I think I identify more with your ideas! 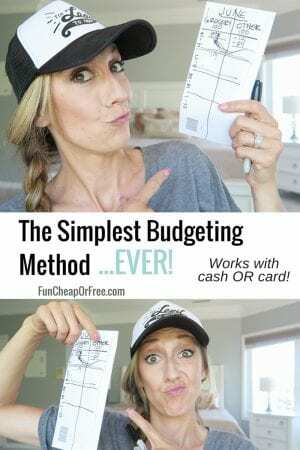 This budgeting method has seriously changed my life! Is that cheesy?? But no for the first time budgeting makes sense and I like doing it!! We are wanting to get our finances in shape-love all your posts! The best “envelope method” ever! Your tips are amazing, especially to make things more simple for a moms/families!! Thanks for these great tips! I’ve always been a saver but not in geoceries other than a few coupons. This method has helped me go from a 1200 grocery bill to 600. I have a family of five but two teens so they eat like 4 people. Yikes! I stumbled onto your laundry video & that led me to watch more when I found the budget envelope. So thankful, this has made a tremendous difference not only money wise but the way I look at my shopping items, price checking, keeping me focused, & so forth. This works!! For anyone skeptical it works it really works! Thank you Jordan I can’t say enough! I LOVE that you split everything into 4 weeks. IT IS SO MANAGEABLE. I always failed at budgeting because 30 days is just way too long. I also love your grocery tips. We are a family of 2 adults and a dog and I’ve been really good at keeping our grocery budget right around $200- including toiletries! I’ve combined shelf cooking methods and have wasted so much less food. I’ve been doing this since January and have paid off over $1k of debt. SO grateful for you sharing all of these things!! This has been life changing for my husband and I. Such a big change in only two month’s of this method. Thank you so much for taking time to share! This was life! I appreciate you putting great info out there just to help people budget. So thankful for this method. I have always been a saver & focused on having budgets but somehow it never translated to my geoceries other than a few coupons. I have a family of 5 two being boys & teenagers so they eat for 4. My groceries were around 1200 a mth. & because of Jordan’s method I went down to 600. There was nothing I could cut from our mthly. expenses or so I thought & I was like, “Lord please help me.” I saw Jordan’s laundry video & just kept watching more & finally saw the envelope video. I was always a mthly shopper before. This method works it really works! For anyone thinking they can’t do it “You Can.” I’ve been doing this for 3mths now. The weekly budget keeps me focused on what I really need & out of the multiple trips to the store. So appreciative of you Jordan!!!!! I love this so much. So easy to follow, stick to and keeps everything so organized. We need to try this! We’ve been trying to get back to budgeting this year (we were super consistent with it for over a year and then my husband took over😂), but I’ve been finding the traditional methods too complicated and time consuming. If we can figure out a way to split up our expenses (we both cook and grocery shop) this could make life so much easier! This is genius! I didn’t think it’d make such a difference but it’s great to visually see how much we’re spending each week! Thank you for all the great content! It inspires me to get my house and budget in order. HOW to budget for a family of 3? Love, love, love this budgeting method! I’m so energized by your method and am excited to incorporate it into our way of living!! I’m excited to dive deeper into all of this information you’re sharing! I love this system. It has saved me so much money. The $100 per person per month is so reasonable and a little challenge for yourself to make sure you’re getting a good deal to help stay in your budget. And its an easy way to have your receipts organized. Love this method! I’m an accountant who hates budgeting for herself because so many systems out there are too complicated & I just don’t want to lol. I started using this last month & now im hooked! It is super easy and makes me very aware of where my money is going. I have now made my sister start doing this too. So helpful! I’ve been using this method lately… and it WORKS! This is how I originally found you!! Your personality and openness kept me coming back for more! You are truly an inspiration to me in so many ways!! This method using the envelope has been a game changer for me, especially with groceries. I have been cooking from scratch and trying to save money while feeding a large family for quite a while, but it wasn’t until I broke it down by week and stayed accountable with the running tab on the envelope, that I was truly able to stay within my desired food budget each month. I always tried to just stick to a monthly food budget in the past, and it does not work nearly as well as the envelope system. Thank you! Love this. Hoping to one day purchase budget boot camp for more! I really love this idea. Seems so straight forward and doable. Been following you forever. From way back at the old house when you’d stay up late and post you tube videos from your kitchen table. You are full of advice that’s simple and smart and I’d love to win your boot camp. Ha Dt bougjht bC I’ve followed you for so long I assume I know what’s going to be in it and we don’t have Much debt so it’s hard to justify the cost. But…… if I was lucky enough to win it. I’d watch it all and live by it! So easy! I’m torn on this or having it all separated into separate areas. Gonna just start and see what happens. We did Dave Ramsey and it was awesome for about three months, and then I stopped keeping up with our budget. This is a much simpler idea, thank you!! A way simpler envelope system! We used to have a million envelopes. Then I bought a wallet with 4 file folders. I love that wallet and I can apply a week by week mentality to it! I love love LOVE how simple this is. Thank you! I think I was watching this particular “ envelope guidances “ four times. I’m very inspired by this and I think I can do it. Going into stores thinking of it . Funny, your face popped out in my brains now 😂. I have tried to read through the comments to see I found this is answered but didn’t see anything. My question is what do you do about and expense that is over the weekly budget but only happens every once and a while. Example: hair appointment that is $200 (weekly budget is only $100) or Vet bill? I’ve been doing the envelope system for about 2 month so now and love how easy it is and really makes me think when I’m out if I really need something. You are amazing! I am a recent follower (I found you through the I am Mom Summit if you track that info 🙂 ) and have been enjoying all the youtube content. Question about the 10% tithing. When I brought this to my husband he said,” we pay on the pretax amount, so that would be like 26-30% goes to tithing, then live off 70%. Doable, but we’d have to change A LOT of things.” To me this was a big “wow” moment, bc if we’re paying that much in tithing, isn’t that MORE than 10%, but to him this is the way he was taught to pay tithing, so he thinks switching to your method would be sinning (not joking…help me out girl, bc I really want to get him on board with a budgeting system we’ll stick to, instead of one we talk about then shelve.) Tips? Tricks? Advice?? Also ! On the other side of the envelope . I’ve noted birthdays , parties and anniversary’s and holidays etc for that month . So I’m prepared:) even more ! Thanks again ! I live all of your videos ! I’m confused about how Costco factors into your weekly grocery budget. If I buy diapers, wipes, paper towel, and toilet paper at Costco one week, that’s at least $100, which technically used up my $100 per week grocery budget for a family of four, without even purchasing food. Since Costco is a bulk store, shouldn’t it be a separate? It doesn’t seem that buying in bulk and having a weekly budget is compatible. Where does gas fall into? Family, grocery, or other?? What if both of us grocery shop (separately on multiple occasions )? Should each of us be allotted 50% of the $ amount ? Where does clothing go? The other column? It seems like that would eat up that column super fast. Also, some weeks we spend more money eating out because of schedules and nothing on grocery so would that go under grocery? What are the small boxes for? Totals at the end of the week? What is the square in the corners for? I absolutely LOVE this envelope budgeting method! It has helped me “shrink” my budget because I am focused on smaller portions of money each week INSTEAD of just seeing the $ in my bank account and thinking I have lots to spend….which, inevitably lead to OVERspending every month. I have been using your printables for 4 months now and have not had to use my CC at ALL to cover expenses at the end of the month!!! WHOOO HOOOO!! Thank you so much for this amazing idea. I feel like you’ve lifted a weight off of my shoulders. I love the envelope for budgeting personal spending responsibilities.